Most of the day trips, excursions and further attractions available to tourists in Langkawi involve other islands and beaches. Langkawi is made up of many islands and boat tours to some of them are quite doable. Payar and Dayang islands are particularly popular and serve as perfect excursions for island hopping. The island of Penang, farther south, is also a hugely popular destination in its own right and deserves a visit, while off to the north-west is the Thai paradisiacal island of Koh Lipe, which is very much renowned for its sumptuous sandy beaches and awesome scuba diving. 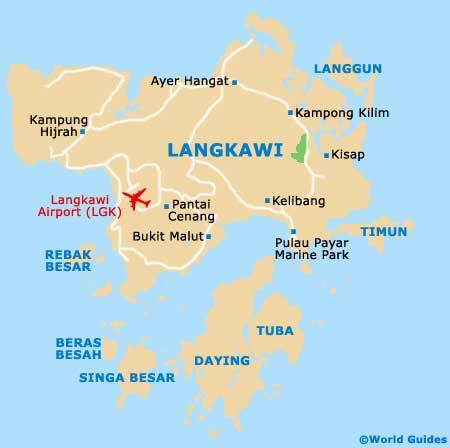 Langkawi is a sizeable collection of islands that are close-knit and easy to explore on an island-hopping tour. Popular islands to check out include Payar, Rebak, and Beras Basah. Dayang Island is also a top-draw destination, being home to the Lake of the Pregnant Maiden, which is often known as the Tasik Dayang Bunting. A day trip takes around four hours and there are daily departures from Kuah, morning and afternoon. Pulau Payar, or Payar Island, deserves a special mention, since this small island boasts fine beaches and some superb scuba diving. Langkawi Coral is the main operator running tours to the Pulau Payar Marine Park, where day trips offer some of the best scuba diving and snorkelling opportunities within the entire archipelago, owing to clear waters and an abundance of coral. Further attractions on the island include hiking trails and a small choice of accommodation. Pulau Payar can be reached in approximately 45 minutes from Kuah by boat. The popular island of Penang is off to the south of Langkawi and is a must-do for those with time on their hands. Penang was the site of a British colonial outpost in the 1800s, which was based at Georgetown, the island's capital. Today, Georgetown's Colonial District is loaded with historic sights and attractions, such as the Cathedral of the Assumption, the State Assembly Building and the Victoria Memorial Clock Tower. The beaches aren't the best on Penang, but this is a real living and breathing Malay island. Koh Lipe in Thailand lies just north of Langkawi and offers a completely different perspective of the region. It is part of the spreading Tarutao National Marine Park, although it is inhabited and has accommodation, eateries and shops. Most of Koh Lipe boasts great diving and fine beaches, of which Pattaya Beach (not to be confused with the brash Thai resort town of Pattaya) is the most popular beach and a good place to hire both scuba diving and snorkelling gear. Koh Lipe is best visited anytime between October and May.